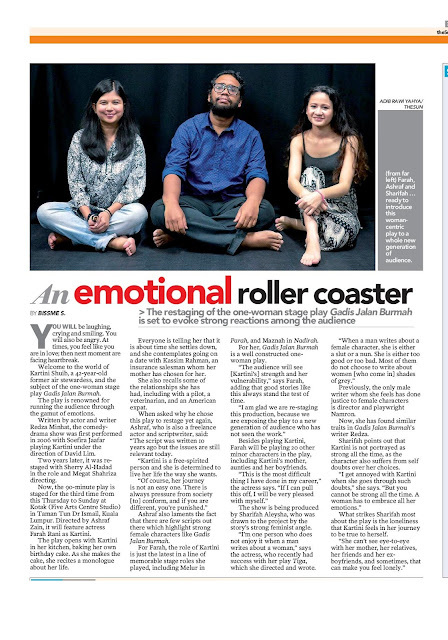 Sharifah Aleysha, Farah Rani and Ashraf Zain talks to theSun about theatre production Gadis Jalan Burmah. The interview was published today. You will be laughing, crying and smiling. You will also be angry. At times, you feel like you are in love; then next moment are facing heartbreak. Welcome to the world of Kartini Shuib, a 42-year-old former air stewardess, and the subject of the one-woman stage play Gadis Jalan Burmah. The play is renowned for running the audience through the gamut of emotions. Written by actor and writer Redza Minhat, the comedy drama show was first performed in 2006 with Soefira Jaafar playing Kartini under the direction of David Lim. Two years later, it was restaged with Sherry Al-Hadad in the role and Megat Shahriza directing. Now, the 90-minute play is staged for the third time from this Thursday to Sunday at Kotak (Five Arts Centre Studio) in Taman Tun Dr Ismail, Kuala Lumpur. Directed by Ashraf Zain, it will feature actress Farah Rani as Kartini. The play opens with Kartini in her kitchen, baking her own birthday cake. As she makes the cake, she recites a monologue about her life. Everyone is telling her that it is about time she settles down, and she contemplates going on a date with Kassim Rahman, an insurance salesman whom her mother has chosen for her. She also recalls some of the relationships she has had, including with a pilot, a veterinarian, and an American expat. When asked why he chose this play to restage yet again, Ashraf, who is also a freelance actor and scriptwriter, said: “The script was written 10 years ago but the issues are still relevant today. Ashraf also laments the fact that there are few scripts out there which highlight strong female c haracters like Gadis Jalan Burmah. For Farah, the role of Kartini is just the latest in a line of memorable stage roles she played, including Melur in Parah, and Maznah in Nadirah. For her, Gadis Jalan Burmah is a well constructed one woman play. “The audience will see [Kartini’s] strength and her vulnerability,” says Farah, adding that good stories like this always stand the test of time. Besides playing Kartini, Farah will be playing 20 other minor characters in the play, including Kartini’s m other, aunties and her boyfriends. “This is the most difficult thing I have done in my career,” the actress says. The show is being produced by Sharifah Aleysha, who was drawn to the project by the story’s strong feminist angle. “I’m one person who does not enjoy it when a man writes about a woman,” says the actress, who recently had success with her play Tiga, which she directed and wrote. Previously, the only male writer whom she feels has done justice to female characters is director and playwright Namron. Now, she has found similar traits in Gadis Jalan Burmah’s writer Redza. Sharifah points out that Kartini is not portrayed as strong all the time, as the character also suffers from self doubts over her choices. “I get annoyed with Kartini when she goes through such doubts,” she says. What strikes Sharifah most about the play is the loneliness that Kartini feels in her journey to be true to herself. “She can’t see eye-to-eye with her mother, her relatives, her friends and her ex boyfriends, and sometimes, that can make you feel lonely."